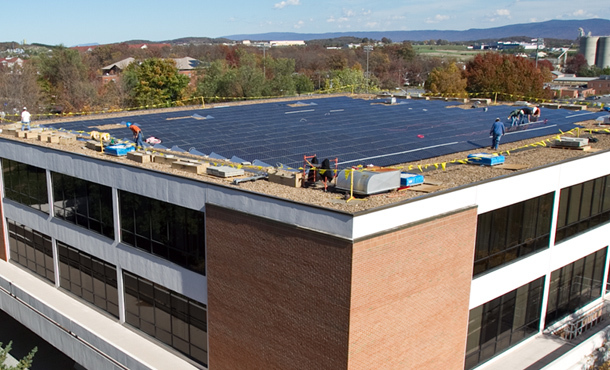 Judging by its performance over the past 10 months, the solar energy system at Eastern Mennonite University (EMU) will exceed the annual guaranteed power production by 12 percent, according to officials at Secure Futures, the company that owns and operates the system at EMU. Since beginning operation, the system has offset more than 105,000 pounds of carbon dioxide, equivalent to the carbon reduction of 85 mature white pine trees—or enough energy to brew 2.6 million cups of coffee. The system consists of 328 high-efficiency photovoltaic panels manufactured by the SunPower Corporation. Southern Energy Management installed the panels for Secure Futures. At capacity, the system can generate 104.3 kilowatts of electricity, making it the largest solar project in Virginia with enough power to supply two percent of EMU’s average annual energy demand. “Traditionally, cultures around the world have marked the end of summer with the autumnal equinox. This year, we are fortunate that we can follow their example with a modern twist, capping off the sunny season with a celebration of the exceptional power of solar energy in action,” said Secure Futures CEO Dr. Tony Smith, who also co-directs EMU’s Steward-Leadership MBA Program. Secure Futures L.L.C. offers clean and affordable solar energy generated on-site to colleges and universities, local governments and other institutions operating in the public interest. Through Solar Power Purchase Agreements (SPPAs), customers can reduce their electricity costs and protect themselves against future price increases from electric utilities without the high up-front cost of installing their own solar power equipment. Secure Futures is based in Staunton, Va., and may be found online at www.securefutures.us. It is great to see EMU put their actions to meet their philosophy and committment to a better world. Hopefully this will continue to stir others into action, I am glad to be an alumni of an institution that can “brag” without stretching the truth. Keep “bragging” letting the rest of us know of the difference an institution like EMU can and is making. You are one of a kind . Continue to seek ways in which you can be better.